Master of Wine that is! It is true that many people awaited that result having faith in me, believing in me. Thank you from the bottom of my heart. I passed my Diploma in 2011 and although I managed every year to be successful in something, (2011 admitted in the IMW course, 2012 First Year Assessment, 2013 passing Theory and 2014 the Practical nightmare) the suspense during this last week before the results of my Research Paper were revealed, was immense. 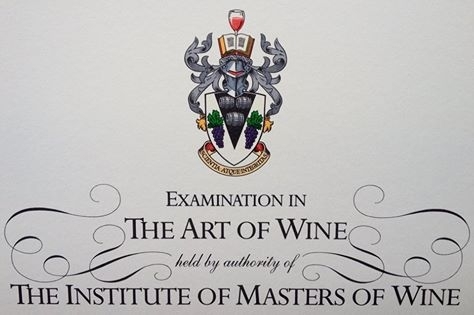 A "Pass" in the Research Paper was the magic word that automatically meant that I had became a Master of Wine, for many people the most exotic and prestigious wine title. When reaching the Research Paper part, one may think that is almost impossible to fail, but as far as I am concerned, this is not the case at all. Underestimating any step during this wine marathon is a huge mistake. The truth is that you can fail anytime during the program or even never admitted to join. At the moment I joined the RP adventure, I was fully aware that this year competition would be tough with close to 30 RPs expected for submission. It is also true that when I first started the paper, I entered a completely unknown territory and this meant hard work from the very first moment. Data, statistical process, analysis were some of the key tools of my mission, tools never used before. The hardest part was however finding a topic! It had to be something solid where literature existed and where data was possible to collect and research. Naoussa seemed a one way street! Mainly inspired by Wines of Northern Greece Research ( Spinthiropoulou H, Marinos V, Koundouras S, Goulioti A ), the topic of the rise in alcohol over a 20 year period seemed quite challenging and proved to be an excellent choice. Conclusions were more than interesting showing clearly where this icon PDO for Greek wine is heading and it gives me great pleasure that I will present them during the Naoussa Conference (11-13 December 2015) and in Rust MW Seminar in January. I had been lucky because apart from a magnificent lady who acted as my advisor, Angela Muir MW who literally "squeezed" me (for my own shake of course !!! ), I had the support of Professors Stephanos Koundouras and George Kotseridis, both for viticultural and vinification issues. Thank you all and thank you again! There is a huge thank you that goes to Konstantinos Lazarakis MW who showed the way acting as my mentor for the first 3 years. I'm sure he's proud of me. The MW title also comes, I think, in an ideal moment for Greek wine. We need to seize this unique chance, this favourable momentum for Greek wine not 100% but 1000%. Santorini is in a fast mood, with Naoussa, Nemea and Crete following right behind. Cephalonia shows a lot of interest and Amyndeon is exciting as well. Interesting efforts are taking place in other areas; Drama is emerging with indigenous varieties as well, Attica is making a loud entry and Samos remains a stable force. That said, when other countries are still struggling for just their first MW, Greece has two and this is good news for Greek wine in general. 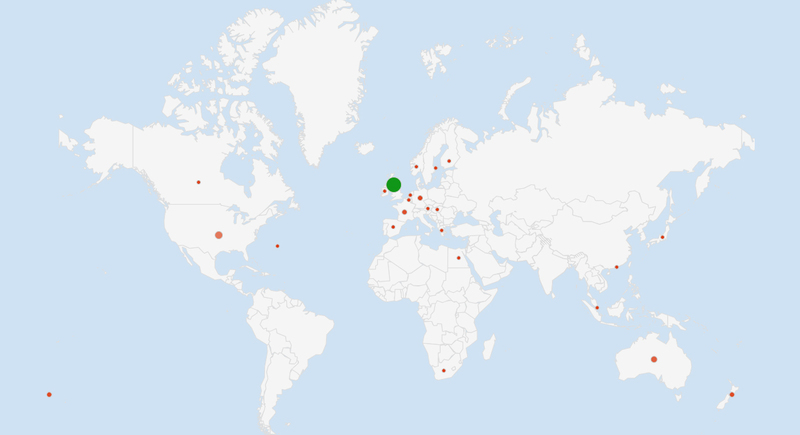 The map below recently published by Decanter shows where Masters of Wine are based with England having the biggest share (209 out of 340 MWs), another 50 shared between Australia and America, leaving 80 MW scattered in 22 countries.